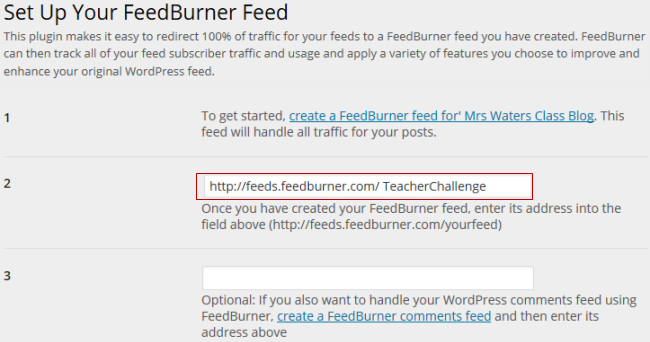 The Feedburner FeedSmith Plugin allows you to redirect all your blog feed to your FeedBurner Feed. Blogs automatically have an RSS feed. The rss feed is found by going to yourblog.edublogs.org/feed. RSS feed readers like Feedly automatically detect your RSS feed from your blog URL so there is no need to know the feed URL or to set up an RSS feed for your blog. 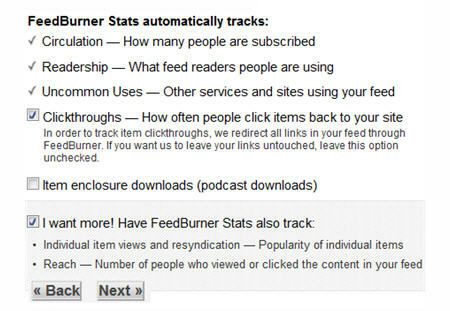 Feedburner is a free web service which some bloggers and podcasters use to manage their RSS feeds and track their RSS and email subscribers. Once you’ve activated the Feedburner FeedSmith Plugin in Plugins > All you need to go to Settings > Feedburner to add your Feedburner feed URL. 2. 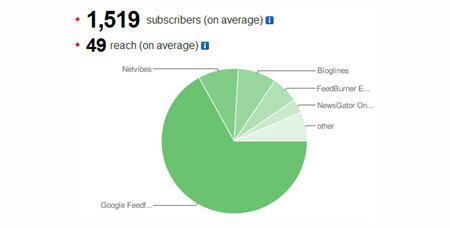 Sign in to Feedburner with your Google Account. Create a Google Account first if you don’t have one! 3. Add your Blog URL to the Burn a Feed Right This Instant and click Next. 4. Leave RSS 2.0 source selected and click Next. 5. On “Welcome” page, make sure you are happy with the title and FeedBurner address (URI) of your new feed and then click Next. 7. On the stats configuration page select Clickthroughs and I want more! and then click Next. 1. Click on Edit Feed Details inside your Feedburner account. 2. Copy the feed address. 3. Go to Settings > Feedburner in your blog dashboard. 4. Add your Feedburner Feed URL. 6. Your RSS feed is now automatically redirected to Feedburner.